I think I previously mentioned our fridge was broken and we had to get a new one, which was delivered on Tuesday. While it sucked to have everything in the freezer thaw out completely it did provide an opportunity to clean out the fridge of all those unused items which find their way to the back. Some nasty stuff in there too. However, when you clean it out you eventually have to re-stock it. 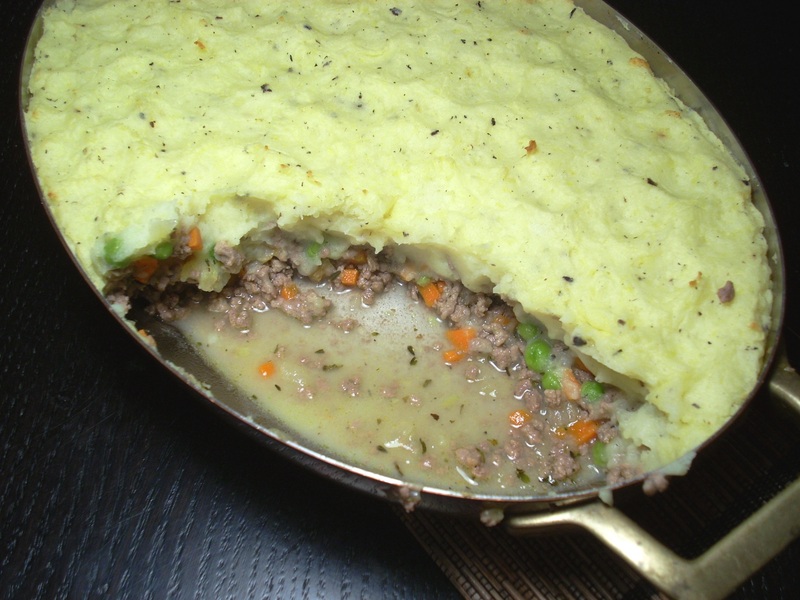 While at the grocery store this week doing just that I saw they had some ground lamb and immediately thought this week we’re having Shepherds Pie. 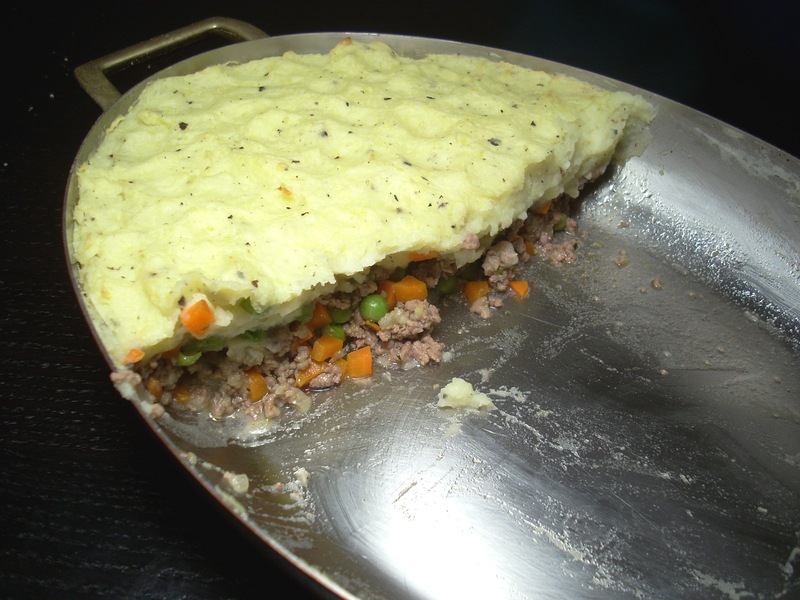 Meat and potatoes in a “pie” form. Mmmm. Staple of Irish pubs everywhere. Except probably Ireland, I don’t know, never been there yet. It’s really great to make this if you have leftover mashed potatoes but who ever has lots of mashed potatoes left? This didn’t take that long to prep, time including cooking and mashing the potatoes was about 45 mins. While the potatoes were cooking I made the lamb mixture in order to avoid any down time. Another ½ hour in the oven and you’ve got a fairly quick weeknight dinner. Ok not that quick, but a not-so-hurried weeknight dinner then. Tonight I even got to use some new kitchen toys from Christmas. When making the mashed potatoes I got to use my new ricer. Goodbye hand masher! I just needed a wooden spoon to mix everything together and they turned out really smooth and creamy. Did you get any truffle salt or truffle gatherer’s sauce for Christmas (like me)? If you did, add some of these to your potatoes. In fact you should be doing this any time you make mashed potatoes. Readers take note on tonight’s dinner: minimal leftovers. Wash, peel and cook your potatoes in salted water. Drain when tender. Add milk, butter and mash until smooth. You can adjust and add more milk and/or butter to your liking. Add about 2 tsp of the truffle gatherer’s sauce (if you have some) to the potatoes and enough salt to taste. Set aside and save for the top layer. Take mixture off heat and allow to cool a little. Place cooled mixture into an oven-proof gratin pan or casserole dish. (The one I used is a 12×9 inch oval pan.) Spoon mashed potatoes on top and spread with a spatula like icing a cake. Bake uncovered in oven for 40 mins.